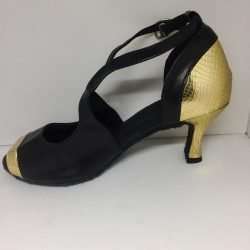 Dance Shoes for Oriental Dance and Latin American Dance. There are many advantages to wearing dance shoes during your performance. Besides the obvious, like a shoe being a beautiful accessory, it protects your feet and gives you better posture. The majority of professional belly dancers in Arab countries (apart from Egypt) and Turkey use dance shoes. 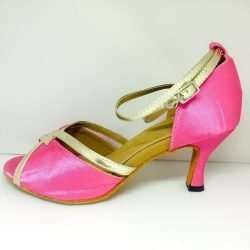 The shoes have a soft sole that is made for dancing and bends with the foot. When dancing “on your toes” your feet are supported by the heel. Even in movements that require the dancer to go down in a sitting position like floorwork, zaar or khaliji, the heel gives support and balance. In addition, if you perform at outdoor stages or in carnival trains, shoes are a huge help as they both prevent your feet from getting cold and protect them from glass, dirt and more. The straps can be regulated and keeps the shoe in place. 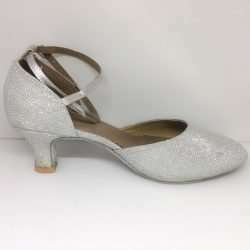 A tip is to start with a lower and more wide heel and work your way to higher heels as you get used to dancing with shoes.